Houghton Mifflin Harcourt (HMH) today launched the first HMH Field Trips for Google Expeditions for students grades K-12. Announced at the International Society for Technology in Education (ISTE) conference, HMH’s offering currently includes four field trips aligned to select HMH science and social studies curriculum, which are now available via the Google Expeditions Android app. More than 20 additional HMH Field Trips, as well as iOS availability of the Expeditions app, are planned for release over the coming months. Relevant programs will contain free teacher guides for HMH customers, including student activities and lesson plans, which will enable educators to integrate the virtual field trips seamlessly into their classrooms. 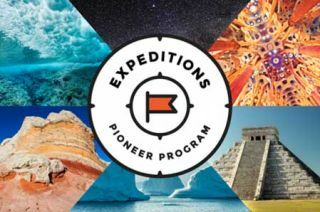 More than 20 additional HMH Field Trips for Google Expeditions are planned over the next several months, including journeys to the Alamo, Gettysburg, the Kennedy Space Center at Cape Canaveral, and back in time to the Roaring Twenties. HMH is showcasing all four field trips at its ISTE stand located at booth #1711.